Winter break is a quiet time at Wabash. The students have finished their finals and bustled off in a million directions. This is also the time of year when the division between seniors and underclassmen becomes apparent. For all the underclassmen, this is just a time to kick back, relax and indulge in all that Winter break offers. For the seniors, however, the joy of break is short-lived. Right after New Year’s Day the seniors will start filing into Lilly Library to study because as anyone connected to Wabash knows – it’s time for comps. Comprehensive examinations came to Wabash as a part of the major curriculum revision of 1928. The changes were revolutionary on campus. They were bold and intended to “focus the study” of our students. This is the change implemented by President Hopkins and a mostly young faculty in the late 20’s who wanted to increase the academic profile of Wabash. One lasting change was the creation of the divisional system on campus. Originally there were four divisions as follows: Div. I – Sciences, Div. II Foreign Languages, Div. III Social Sciences, Div. IV English, Speech, Religion. Another addition to the curriculum was, “…a new course, to be taken by every student in freshman year, which should enable him to see all the fields of study not as distinct but as closely related…” initially this class was Contemporary Civilizations. This required class was later moved to the sophomore year and modified into Cultures and Traditions. Expanding on this idea, a freshman tutorial is now required of each student and all sophomores take a class called Enduring Questions. The curriculum is always changing and evolving, as it should, but the addition of 1928 that weighs most heavily on the minds of students at this time of year is the comprehensive examination, first given to seniors in 1932. The purpose of the comprehensive exam is for the students to demonstrate mastery of their major subject. From the Report of the Special Faculty Committee of 1927, “These examinations are to be given at the end of the senior year, and will cover the subject matter of the student’s particular field of concentration…It is essential that it be clearly understood that to pass these examinations is an absolute requirement of a candidate for a degree, and they must in no case be perfunctory or notoriously easy….” I think that most Wabash men would agree that this is still the standard. Tough, rigorous and daunting are a few of the adjectives that are applied to comps. So each year after the holidays are over, the seniors return to campus. 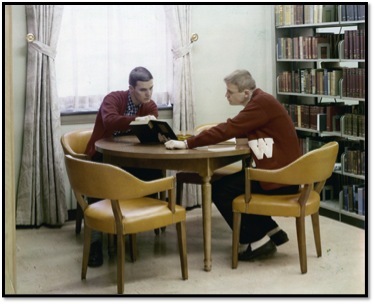 We see them in the Lilly Library studying alone or maybe with another guy, but working hard. Comps are a big deal and all Wabash men since the Class of 1932 have shared this challenge. Best wishes to the Class of 2013 as they prepare for this rite of passage – soon they will join the 80 classes of men who came before them in looking forward to the next and final stop in their student journey – Commencement 2013!